Womack’s Baseball Academy opened at the Simi Valley Town Center in April 2019. This 6,000 square foot indoor facility offers private lessons for pitching, hitting, batting and catching, group classes for strength and conditioning and batting cage rentals. The facility is also available for birthday parties, with options including yard games, access to arcade room, dodgeball, cage rentals and more. Located across from Tilly’s at 1555 Simi Town Center Way, #645. More information at www.badirtbags.com or by calling 805. Founded in 1989, Simi Valley Batting Cages and Pro Shop offers full service batting cages with baseball, slow pitch and fast pitch softball, hardball/softball instruction and equipment. Indoor/outdoor facility. Located at 2019 Donville Avenue, Simi Valley. Open weekdays noon to 9pm and weekends 10am to 8pm. 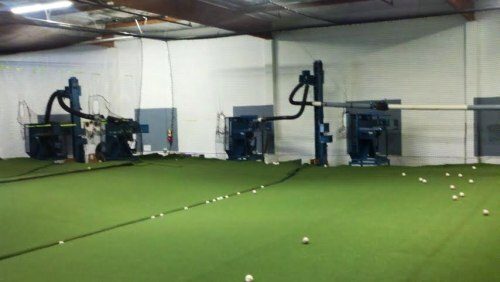 Call 805.527.8998 or visit www.facebook.com/svcages or simivalleybattingcage.com for more information. All Stars Athletics, located at 711 Rancho Conejo Boulevard, Newbury Park, is a 13,000 sq. ft. indoor sports facility that provides training and instructional opportunities in baseball, softball, soccer and more. There are 7 automated baseball/softball batting cages suitable for ages 5 to adult, a 3,500 sq. ft. multi-sport astro turf training area, a team room area that seats up to 15 people, waiting area with WiFi access and more. They also offer party and corporate event packages with fully supervised and customized games and optional access to batting machines. Visit www.allstarsathletics.com or call 805.498.6200 for more information. The Hitting Zone at 31285 Via Colinas in Westlake Village is an indoor training facility that features indoor batting cages, private instruction, camps, clinics and more. Visit www.hittingzonewestlake.com or call 747.249.2416 for more information. Open seven days a week. MVP Baseball and Softball Academy is located at 3653 Old Conejo Road, Newbury Park. Offers batting cages and pitching machines to the public. Bullpen area, camps/clinics, private instruction, pro shop, etc. More information at www.mvp-academy.com or call 805.498.4687. The Camarillo Girls Fastpitch Softball league has been around since 1984. For girls ages 4 to 16. Teams play in the spring at locations throughout Camarillo. Simi Youth Baseball is a non-profit PONY (Protect Our Nation's Youth) organization, run by volunteers since 1962. Games are played at 789 Irvine Road, Simi Valley, near the Sinaloa Golf Course. Five age divisions include Pony 13-14, Bronco 11-12, Mustang 9-10, Pinto 7-8 and Shetland 6 and under. Spring season runs from March through mid-May. Signups in November-December and tryouts in early January. More information at www.simiyouth.com.